For 400 weeks I have made a heart for my beloved Madalene. It started soon after we met, as a weekly romantic gesture as I was so crazy in love. A little heart constructed out of silly things on her doorstep intending to make her smile. During those crazy early days of love, somehow, love cannot be contained, it begs to be expressed. Not content just “being” safely nestled in our chest. Romance, the sweet language of love. Lovers write little notes on napkins bury them deep in lunches, poems scratched on paper plates thumb tacked on the bedroom door. Its so simple and so easy and you can make so much with so little. To take the time to say “I love you”. However you do. Love is a promise. It’s like saying, I hold you in the most sacred part of me. I love the world better when you are in it. I love who you are, and I love how I feel when I am with you. And I promise I always will. Forever. My elder auntie just told me such a romantic story. It melted my heart. As her husband of 70 years began a slow decline, his memory gone, his recognition of the world around him gone. Although most days he could not remember her name, right in the middle of nowhere he would look at her and smile and sing the sweetest little love song he had sung to her as they fell in love. Love is a force of nature. With a will of its own. Resisting definition, love endures. For Madalene and I , our dreams were cut short by her very unexpected sudden death from cancer. Grappling with trying to comprehend having to say good-bye to my love, and having to make the translation from earthly to heavenly, was not easy for me. I decided to make a new promise. Desperate to show Madalene that I was going to love her forever, I promised her I would continue to make her a heart each week for the rest of my life. I figured If there was even the slightest chance that she could see me from heaven, I wanted her to know I would never forget her and would always love her. Unbeknownst to me, it was a lifesaving concrete tangible handrail I grasped as I entered a tsunami of grief and agony. My life preserver. For me it is a way to keep her in my physical world. To maintain this sweet connection. Madalene”s sister once sent me an email saying “Thank you for keeping Madalene so alive for so long” Although I couldn’t have put words to it I am SURE that is EXACTLY what I was trying to do. But it was not to freeze time. More like a conscious decision to focus on the love we DID have and not the loss, and to allow the gentle miracle of healing with the passage of the seasons. Because love doesn’t die. Its like the sky. Or the ocean. It’s alive and rich and ecstatic. And it is eternity. This love has carried me over the storm. So for 400 weeks I have made her a heart each week. And through this weekly devotional act, the transformation occurred. It’s like I grabbed the ring at the carnival and held on tight and closed my eyes as I flew through the air. Not knowing where (or if) I was going to land. I began sending these hearts out over the internet with the intent to just put all this beautiful love I still had in my heart out into the world as an act of giving. One day it occurred to me to invite people to forward them to THEIR loved ones. Like hearing a song that shakes the bottom of your tree and you share it with someone else you love. These hearts would come from my heart to Madalene, and then through OUR love, they would spread like roots of a beautiful tree. Reaching out splitting off and growing and giving….for eternity. Tall order. But it is happening. I send my hearts each week now to 2500 people all over the world. I get emails each day from people from all walks of life. Old farmers in the Midwest, a filmmaker in Japan. A nurse in South Africa. I recently got an email from an amazing woman, the first out gay person in Serbia, telling me that these hearts bring her so much comfort and strength. A real national hero in this war torn country where being and expressing homosexuality means risking your life. We have begun a very dear correspondence. What an tremendous great honor. I told her how blown away I was that a little heart I make on my table in my window in Oakland for my love, makes its way to her in this faraway land and gives her comfort and courage. How this has now changed ME. It is part of my journey and has brought me a comfort I cannot put words to. And people send ME hearts now. They make them on the beach, or on a pizza or teachers have had their second grade classes make me hearts and sent them to me. My heart melts every time. It dawned on me one day that these could very well be from Madalene. GIANT smile. Through this hearts project I have witnessed the profound amazing power and glory of love. Every kind of love. It is our collective shared language. With all that dived us on this earth, I feel so happy knowing that through this simple sweet weekly promise to my love, now somehow she and I are reaching out and putting OUR love out in the world. Although Madalene and I did not get to spend out lives together here ON THIS EARTH. I feel so good that I CAN spend my life expressing this beautiful feeling and putting it out for humanity, to hopefully make a tiny contribution to making the world a better place. If you would like to join me send me an email to page.hodel@gmail.com and write “subscribe” in the subject. 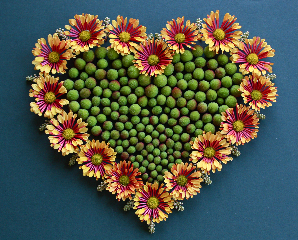 I will send you my “Monday Hearts for Madalene” every Sunday night so when you wake up Monday morning you will have a little heart on your digital door-step. I invite you to make a list of people you love and forward to THEM each Monday. Visit my website to learn more about this project. There have now been 400 hearts. Page Hodel is ALSO a great guest DJ at many of our local lesbian dance parties!we LOVE YOU Page. Thanks for the weekly heart. It never fails to bring a smile and inspire a kind gesture!! What a wonderful and inspiring story, Hodel!!! Thank you.